McDonalds is one of the undisputed titans of fast food in the world. Known for its streamlined delivery of burgers, fries, and even coffee shop inspired coffees McDonalds is also known for its commitment to consumer friendly prices.In fact, McDonalds is so well known for its consumer friendly prices many people who looked at the title of this article probably question if itâ€™s even possible to get deeper deals than what are already available on McDonalds current menu, fortunately it is possible. If you are over the age of 55 you may be eligible for discounts on coffee. McDonalds is known for its consistent coffee quality and it has begun to offer coffee options under its McCafe menu that range from the classic latte, mochas, or even hot chocolate. If youâ€™re looking to request a discount please note that each McDonalds have different discounts available to their patrons. Also, for those individuals who are over the age of 55 you may want to look at discounts offered via AARP or AAA memberships. Resist temptation inflation. 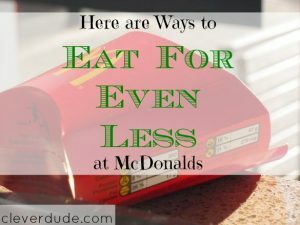 Because McDonalds menu is so affordable people may be tempted to order a much larger meal than they normally would because it is so affordable. Overtime the habit of ordering meals that are super sized through options will add up in the long-run and will eat away at any perceived savings that you may have if you just ordered normally. One would think that there couldnâ€™t possibly be additional ways you can save at McDonalds or other fast food establishments know for their long-standing focus on affordability. Using a few key strategies such as being aware of menu options, thinking outside of the box and crafting your own meal combinations, and making sure to ask your local proprietor about age/military/ or educational discounts will help open up additional savings in the long run. While I don’t eat there often, I actually like McDonalds. We usually wait until we get a coupon “buy one get one free”. Pretty cheap eating out for us.